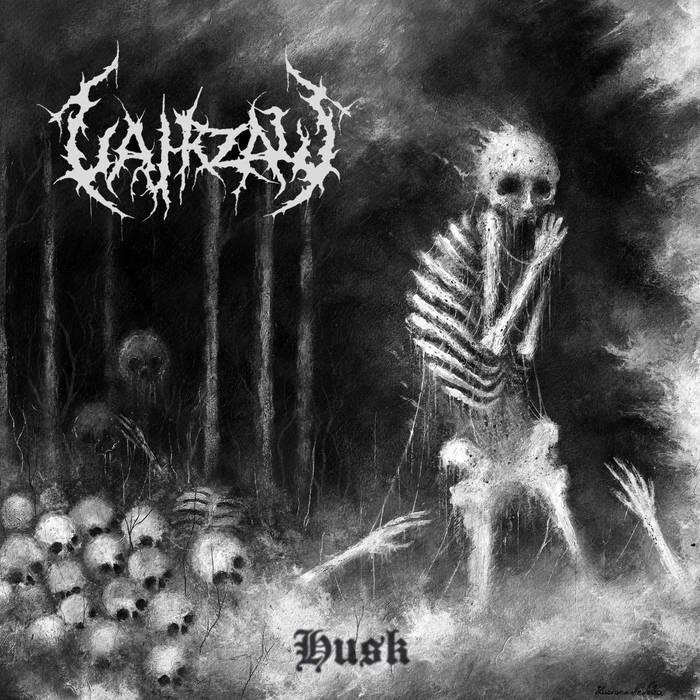 Vahrzaw are an Australian black/death metal band and this is their third album. Here we have the follow up to 2014’s Twin Suns & Wolves’ Tongues. This was a blisteringly aggressive album that combined death metal ferocity into its blackened assault. On Husk the band continue to do what they do best, and they have delivered an impressively nasty 36 minutes of filthy aggression for us to enjoy. The songs are intense and grim. Revelling in its underground status, this is raw and scathing music. Slower and mid-paced parts are included in the songs primarily to set up the raging fury of the faster sections, but that doesn’t lessen their worth in any way. The latter offer more belligerent variety than you might imagine too, as this isn’t a band that are powered by blast beats alone. Vahrzaw give the impression, once you dig deeper into their sound, of an intelligent entity attempting to seem simplistic. Thankfully it doesn’t fully work, as the brutally scathing music they offer has clearly been thought about and considered. As for the former, as well as some decent malevolent groove, these offer some surprisingly atmospheric darkness on occasion. These less aggressive sections once again show off the well-considered nature of the music. Little nuances and interesting ideas appear here and there amidst the general carnage, and when you spot them it enhances the overall delivery considerably. Melodic leads and energetic solos appear here and there; these may be more of an exception than anything else, but when they do appear they spice things up with macabre mood and sinister intent. All of the above adds to the relatively layered delivery that the band have subtly put into their music. Taken at face value, this is an album that simply wants to vent, rage, and murder. On closer inspection, however, there’s a depth here that delivers more to the listener than simply wanton violence and indiscriminate misanthropy. Husk has deeper levels than its violent exterior probably suggests, and the music has a lot more to offer than simple aggression. So, to sum up we have a nasty piece of work here, filled with hatred and brutal aggression. Beneath the surface, however, lies a multifaceted beast of many layers. Sure, it still hates you and wants you dead, but at least it has thought about this and its motivations. This entry was posted in Black metal and tagged Black metal, Death Metal, Metal, Vahrzaw. Bookmark the permalink.